You can specify how ExamXML will validate XML document. 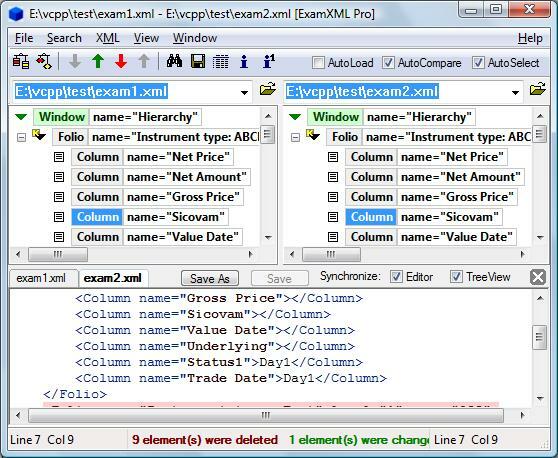 ExamXML validates XML reporting errors with description and line number information. You can specify a log file to print out error messages. Using the Continue after fatal error option you can even validate the entire XML document. 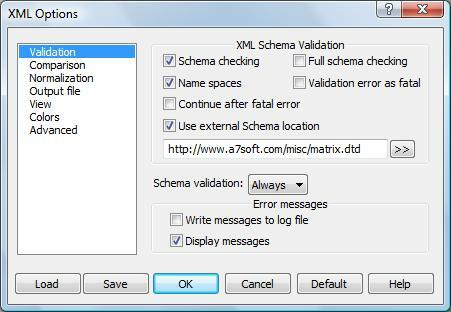 Use External Schema location option allows to validate XML document against schema file not specified within XML file. If External Schema Location is a path to folder, application will search schema files in this folder. The ExamXML XML differencing engine is completely customizable. 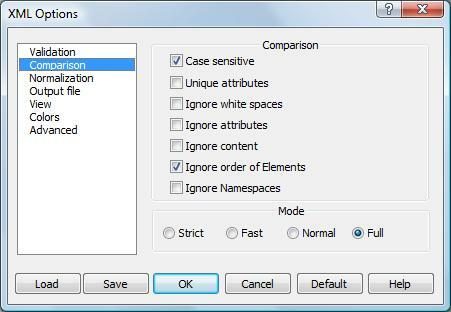 For example, you can specify if white space, case sensitive, namespace prefixes or the ordering of attributes /child elements or even all attributes or content of elements should be ignored or not, and how to perform comparison process. ExamXML provides four comparison modes. Normal for more slowly and complexity comparison and Full for complex and sophisticated comparison. 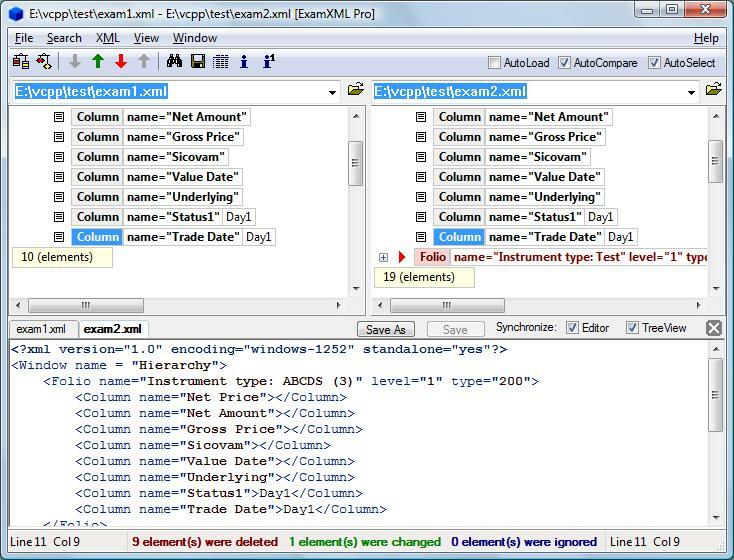 ExamXML provides XML Editor for modification XML documents loaded to Tree View. XML Editor provides you with standard tools for text modification such as hot keys combination Ctrl-X (Cut), Ctrl-C (Copy) and Ctrl-V (Paste). 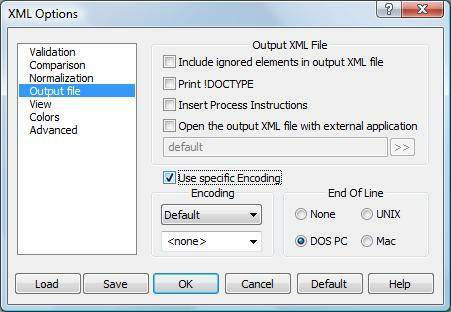 XML Editor allows editing both loaded XML documents. Use tabs with the name for switching between XML documents. You can navigate through xml text using arrows keys and page navigation keys PageUp and PageDown. XML Editor supports synchronization between Editor and Tree View. If you select XML element in the Tree View, XML Editor scrolls text to the selected element automatically. Also if synchronization between XML Editor and Tree View is ON selecting any text fragment in editor leads selection of XML element in Tree View. These elements both present the same day but in different formats. 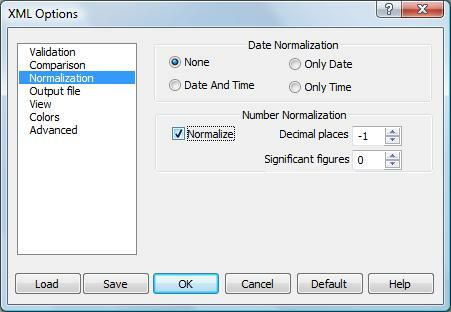 Using normalization you can compare the elements as dates. are equal if you set up the Only Date option. The Number Normalization lets you compare numeric elements as numbers even with rounding up to significant digits. The two numbers 123,456.054 and 123456.05 will be assumed as identical provided you set up two decimal places for rounding. ExamXML can save the differences or similarities to output XML files. It also can merge two XML files in one synchronizing XML elements from both documents. Unlike simple joining two text files ExamXML offers smart synchronization that means intelligently merge of elements with the same name from both files. ExamXML supports all existing XML formats and encoding. ExamXML uses Unicode as internal format of XML documents. It lets you compare XML files in different formats and encoding. You can also specify the Entire element that will be printed including all their successors. This is particularly useful when the element has many sub-elements few of them have been changed. ExamXML allows you to compare XML files ignoring specified elements. You can ignore either the whole element or specified attributes or the content of the element. Unique to ExamXML is its ability to ignore elements that math user defined condition. 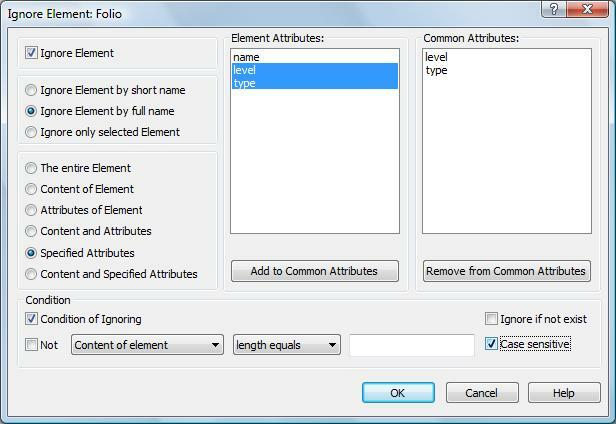 For example you can specify condition to ignore the FILE elements if the NAME attribute equals 20. Every ignored element can be saved to a text file and loaded next time you run the application. Using ignoring, you can compare only elements you need. 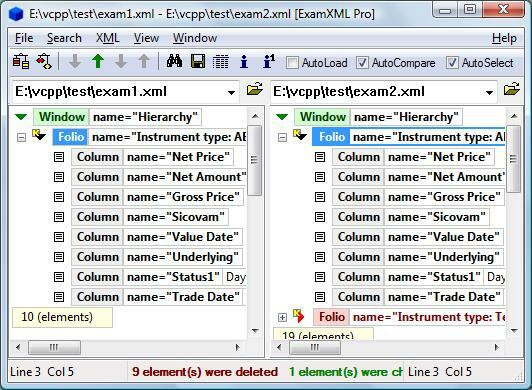 ExamXML Pro provides tool to convert XML elements to CSV (comma separate value). Utility XMl2CSV can be launch from command line but ExamXML Pro makes this launch easier with a dialog box. 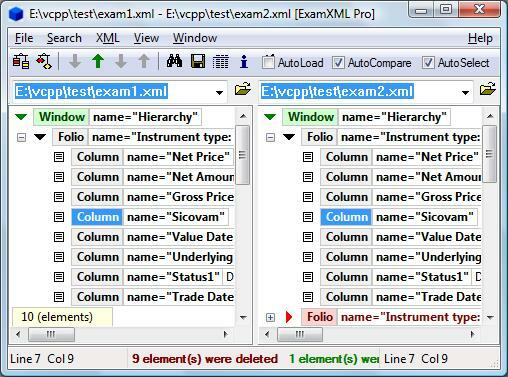 ExamXML Pro generates the field file and launch the XML2CSV behind the scene hiding details. You can specify XML elements to convert and set up optional parameters. Suppose an XML document has many elements with the same name and the structure of the document is similar to the database table. You can specify Key element(s) or Key attributes that can be used as Primary Key in the database table. The value of Key element /attribute should be unique to achieve the best advantage of using this option. 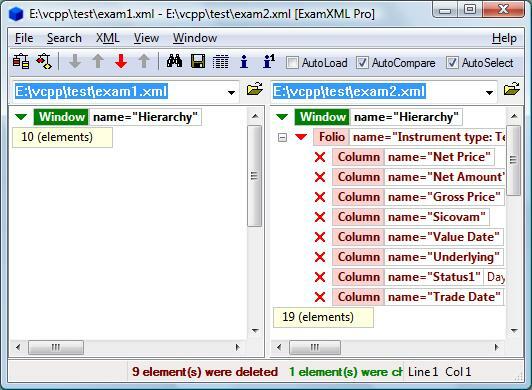 ExamXML Pro supports folder hierarchy comparison, enabling you to compare entire directory trees. This is ideal for detecting changes in different versions of source code or web pages. ExamXML provides three different view modes. In additional to the Normal View that allows you to view the entire XML document, ExamXML adds two view modes that display either differences or similarities. You can simple open XML document using drag-and-drop features. Just select a file from the Windows Explorer and drop it into the XML Tree View. 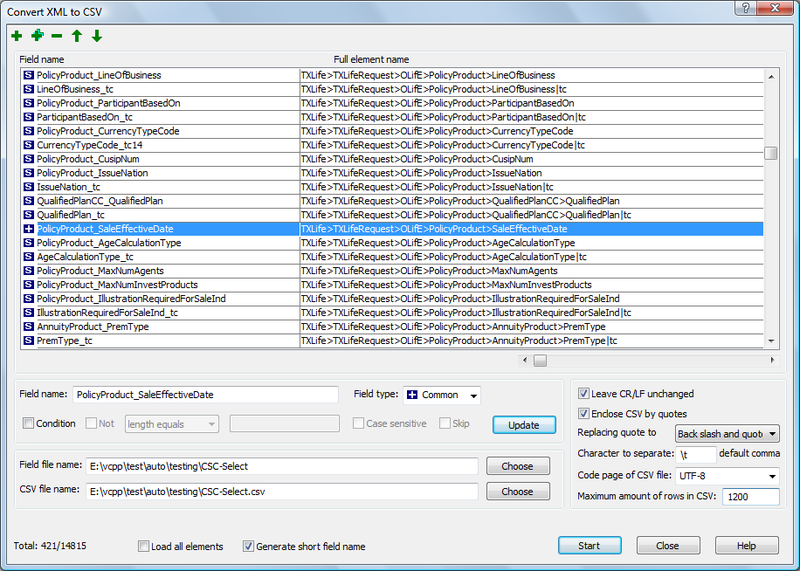 All options can be saved into a text file and can be used next time you run the application. This is especially useful for close integration with command line utility mdcxml which can use the same text file to load options.